In short I've been experimenting on various methods to make my own topographic maps for trips. So far I like the free tool provided by the MNR(toporama) but when I try to save a map using the site at a 1:15000 scale the map area that it allows me to save is too small. My question is: does anybody know of a way to save a bigger section of the map at this scale? What I have been doing is using the print screen option and copy pasting map sections in paint and putting them together. I'm not sure if this option keeps the same scale? What are others doing?? Should I bite the bullet and start ordering topo maps? Despite the influx of the digital/GPS world, I am still a paper map person. Yes you can use the Toporama maps, but as you have done, they must be downloaded in bits then tiled together to make a complete but bigger map. Yes you can manipulate the final image to print it to a define scale. I have painstakingly added the UTM lines onto these downloaded composite images to aid this process, but the end result is a map with the Grid North on an angle. If you can, get your topo from the CANTOPO directory. I use the 50k_tif files. These are higher quality images but not very many NTS maps have been published in this format. The CANMATRIX2 directory should have the complete NTS 50:000 topo series. Again I use the 50k_tif files. After downloading the standard topos of my route (tiff files), I use Photoshop the crop, paste, rotate etc the topo area covering my route should it cover mutiple NTS sheets. I then bring the composite image into a graphic program (I use PowerPoint believe it or not) to annotate the map with paddle routes, portages, campsite location etc. This map is printable at 50:000 / 1 scale. Then to produce map case size sheets, I digitally "chop" up my composite annotated route map into a series of sheets that are 9 x 6 UTM squares. 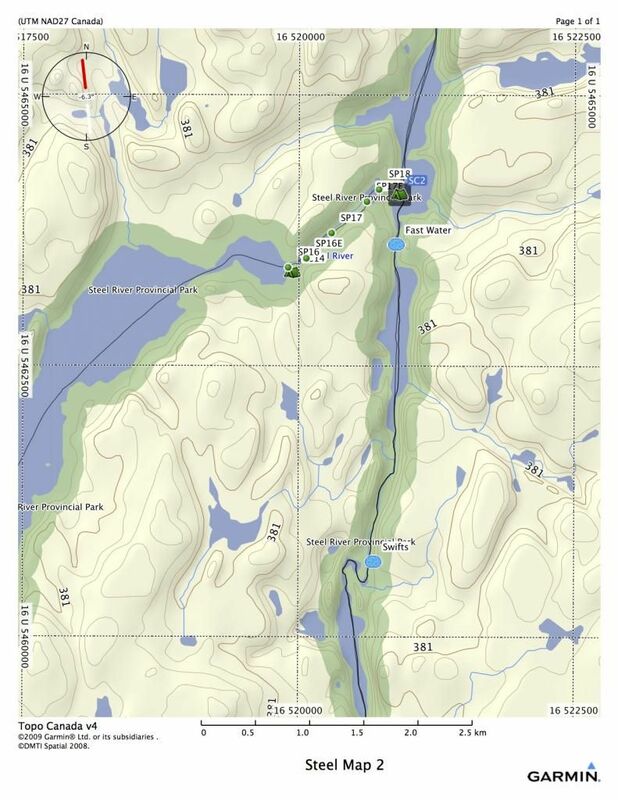 I double the size of the image to make maps 25:000 / 1 for an easier read in the canoe with my failing old eyes. 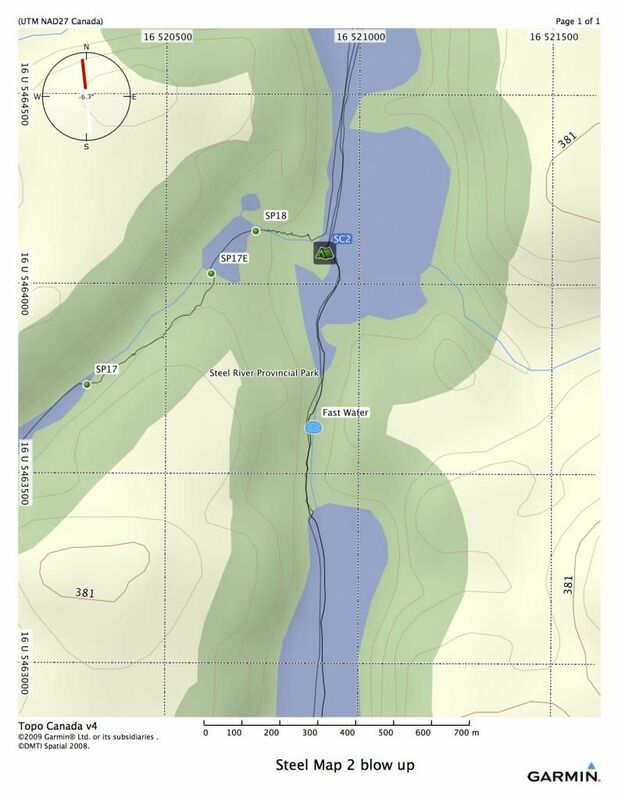 Or.... buy a digital based topo with good color graphics display GPS. I had been embracing the new way of navigating using electronics but last year we had bad luck and had problems with two GPS units.. Long story short I'm sticking to paper from now on and GPS can be in the bottom of the pack as a last case option. Here is a sample final product, 25000/1 scale to be printed on an 11 x 17 color printer. that looks good! do you know if I was to use the "print screen" option my toporama having the displaying at 1:25000 and copy paste it in paint and connect it if my canvas is 11x17 will the scale be ok once I print it? Don't know. You need to have a measurable distance on your image to check, then scale the image (stretch in /or out) to correct. The beauty about using topo images with the UTM grid already on them is that after downloading and printing them, you can check to be sure if they are to scale. UTM squares that are 2 cm = 50:000/1 scale. Stretch the image and make the UTM squares 4 cm, then you have 25:000 / 1 scaled map. The map details don't change but better magnification makes the map easier to read for me in the canoe. You can also use the UTM grid in conjunction with your GPS too, i.e. mark on way points etc. I've essentially done the same as Paddle4fun, but I use Photoshop to aggregate my topos and then crop out 11x17s to fit the map case. You can get better results by downloading the actual 1/50 topo maps and then "cutting" out the pieces you need. A 2400 x 3000 pixel "cut" will print perfectly on 8.5x11 paper retaining the original scale. Follow the instruction provided by Paddle4fun to access the maps. As a bonus the actual Topo's have better detail that the Toporama versions. If you need a quick and easy way to cut the section you can use irfan (free image utility), in that program you can set a default shape to use as your "cutting tool", plop that on the map and then move it around to cover the section you want, hit ctrl-y and save the image. Although bigger files I recommend using the TIFF versions of the maps over the jpeg because the quality will be retained regardless of how many times you make a copy. Later if you need to email them you can convert to jpeg to make the files smaller. Why couldn't they make it easier and build in an option that allows you to select and area then select the scale and voila!!! A site like mytopo does that but of course you pay for the service/printed topo. I download the map files and then tile printable pages using posteRazor. Then I annotate the PDF pages in a PDF program (Preview, comes with the Mac OS). Thanks to everyone for sharing their ideas. If you're tripping in Ont you could give this a try----5 m contour interval. I got Karin a DVD from the map sales office here in Winnipeg for her birthday a few years ago. It has the entire provincewide topo map inventory on it as well as a bit of NW Ontario. When we want a map for a certain area we just scroll through to find it, print, laminate and we are in business. It is a worthwhile investment for anyone tripping in Manitoba. I don't know if other provinces have them, but Manitoba's is very usefull, especially in the planning stages of a trip. I bought the YellowMaps Canada wide 1:50,000 topos DVDs a decade or so back ago. They are just scanned in topo maps (and some are kind of crooked and need to be rectified). Of course every time you plan a trip, the area you are visiting is on the boundary of two maps and I would cut and stitch them together in power point. Took awhile but was doable. Mostly, now I just use the Garmin Canada Topo (only 1:100,000) scale usually suitable unless I really need better resolution and I like this software as it pairs with my GPS letting me preset routes and waypoints. Somebody posted earlier about laminated maps. Last trip I was on, one of our party colour printed a map for each day plan as its own laminated map. I kind of scoffed at the idea at first (always wanting to see the bigger picture), but this turned out to be a lot more handy than I thought and seems worth the added map sets being carried. The convenience of laying a flat laminated piece on the floor of the canoe in front of you over trying to fold over the right section of a folding map is really nice (of course having the regular folded map for big picture orientation tucked somewhere is advised). Sounds like a lot of work to me. I just use basecamp, forget how much it cost, but pretty cheap, around a 100 bucks. The beauty is after the trip, you can make some very accurate maps, complete with coordinates and whatever info you want. If I wanted to make reallynice maps, I suppose to could throw them into photoshop, but the ones I get are suitable for me. I usually use a scale that is close to 1:25000, but the beauty is if things are cramped, you just zoom in for a close up.